Count me in for the contest please. I think it's great that you are doing another give away. Iiiiiiii need to figure out how to figure out if I pre-ordered or not. It went up so long ago (I think?) I don't recall now. I'm drooling over the cover. Please count me in for the random drawing!!! Very generous, no wonder your readers love you! Include me in the drawing, please! Please enter me in your contest. Thanks. Congratulations, you won a copy of Baba Yaga's Daughter! If you can email me your mailing address I"ll get that in the mail for you! 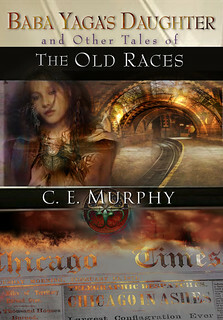 cemurphyauthor at gmail dot com! I'd love to enter to win an ARC. I keep meaning to pre-order this book. Subterranean Press always puts such lovely covers on things. If I'm not too late please enter me into the contest.